Please review our Class Registration Policy for details on signing up. 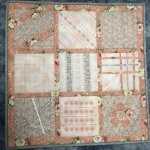 Come join Barbara for this fun optical illusion of a quilted table topper! New Owners class for self-threading Baby Lock sergers. Stitcher's Garden Block of the Month SUPPLY LIST: Some changes each month. Instructor will advise in each class. CONSTANTS: Your machine, embroidery treads, bobbin thread, appropriate feet for each block.